After a long journey entailing bawds, degenerates, and harlots, Moll has found her inevitable. She’s 23. As of September 2, 1731, she’s also dead. A plate atop her coffin records this, but we can be assured that outside the minds of harlots nothing will remain of her memory. After all, she is in a room with the soon-to-be dead–women marked by syphilis or the hangman’s noose. One woman in the plate stares out, making eye contact with us. Her name: Elizabeth Adams. Her execution date: 1737. Her crime: theft. She sits in perfect composure as a clergyman worms his hand up her skirt. Indeed, she is the only composed person in the room, her expression one of sardonic resolution. She knows her fate and yet she doesn’t resist it. The clergyman, meanwhile, is tingling with pleasure, his flute spilling suggestively upon his lap. The other mourners are similarly pursuing their own ends. Moving counterclockwise we see Moll’s child, chief mourner of the ceremony. He leans against his mother’s casket, spinning a top in his fingers. He may as well be alone in the room for all he is disengaged. The wretched procuress directly to the right is moaning, her heel kicked up as if in pain–probably from facing another lost source of income. The bottle of Nantz (or brandy) beside her bears a grim, theatrical face. Is this in reference to the tragicomedy of the scene? The undertaker pursues a harlot whose outstretched hand points toward Moll as he adjusts her glove. Although it is difficult to see, she is plucking from his pocket the harlot’s most coveted accessory: a pocketwatch. 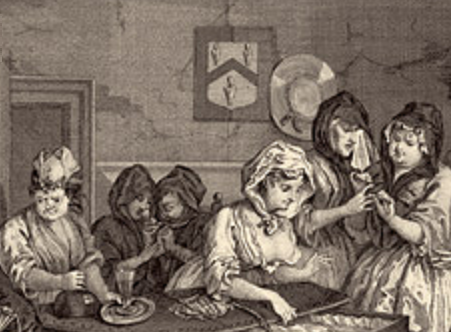 Despite the properly observed mourning customs–the white handkerchiefs, the sprigs of rosemary (once thought to prevent contagion)–nothing is as it should be. Nobody acts as one would assume. The funereal atmosphere is tempered by conceit. A moon shines behind a window and a reflection hovers in a mirror. The harlot inspecting her face has good reason for vanity; a spot appears and with it, anxiety. The “progress” continues. Among the remaining mourners, we have four unidentified harlots in pairs. The pair nearest Moll appear to grieve, most likely for their own fate, but amidst this grieving one harlot complains of her finger pain. The two garbed in black are in full mourning. As one sips her drink, the other wrings her hands. But there is something about them that looks conspiratorial. Perhaps they were foes of Moll and regard her death with both defeat and triumph. It could be my flawed modern sensibility, but with their dark cloaks, they look a little like witches, their heads arched together. 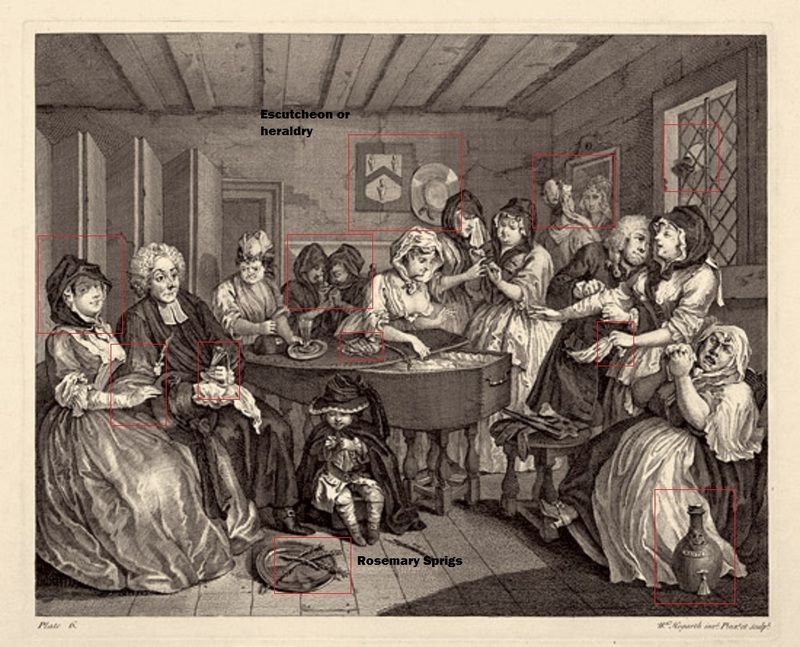 A witches hat and twigs did appear in plate 3 and I can’t help but wonder why Hogarth would distinguish them from the other harlots by putting them all in black. They are also fairly centered on the plate, in view between the two figures sympathetic to Moll, and by contrast I’m not entirely convinced they are, in fact, maudlin. The answer, of course, is yes. It is unlikely Moll’s diseased corpse dissuades the young harlot. Moll herself could not be dissuaded and neither will the thousands who continue after her. The clergymen can’t save them. The men who quench their needs upon them won’t. And so we continue. Missed previous A Harlot’s Progress Plates? Dahhhling just finished reading all of the Harlot’s plates about poor Moll… what FAB creative story teller you are! Enjoyed very much. Why, thank you! I find Moll the anti-heroine and heroine of her tale which–though she does inspire both sympathy and emotional dissonance as the everywhore–makes her utterly fascinating. Am pleased you enjoyed! fantastic blog! truly! a pleasure to read your posts.